It will be here before you know it, so I decided to go ahead and begin to make a few changes in anticipation. 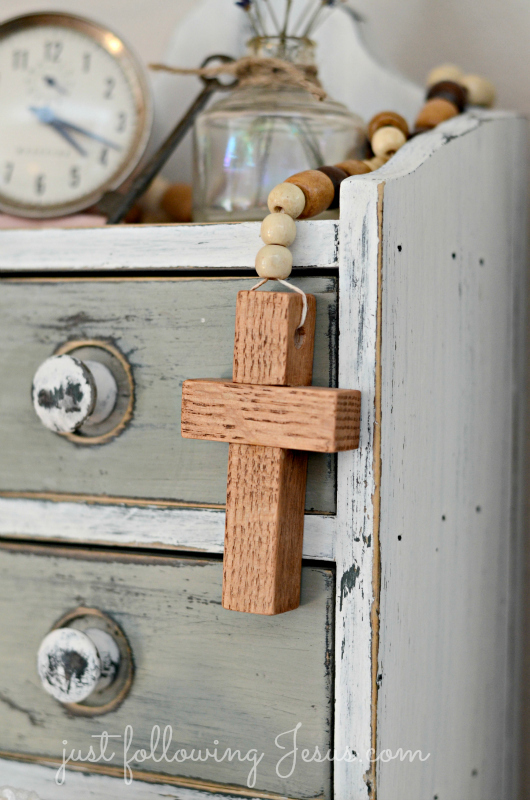 Goodbye Valentine mantel and hello to some hints of spring. 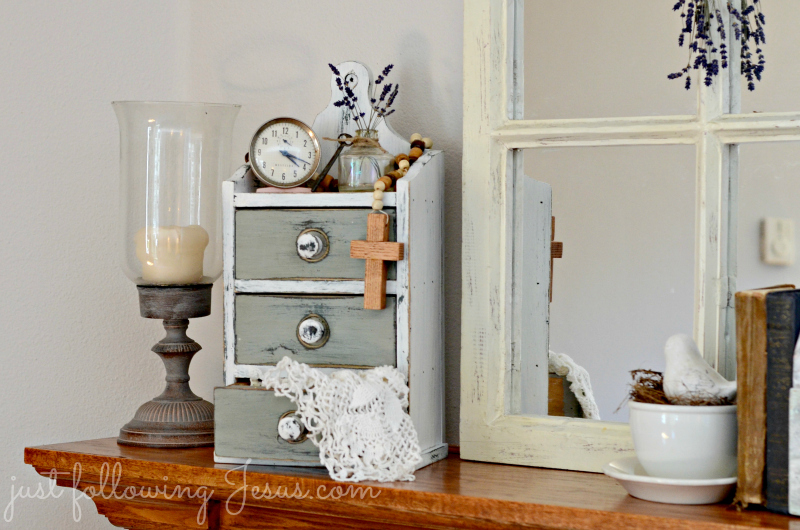 I moved my little pinterest copy cat drawers from my home office down to the mantel. I just used things I already had, but in a different way or place. I wanted to include a reminder of the real reason for Easter in my decorating. I love my old pink alarm clock, even if it doesn't keep time anymore! 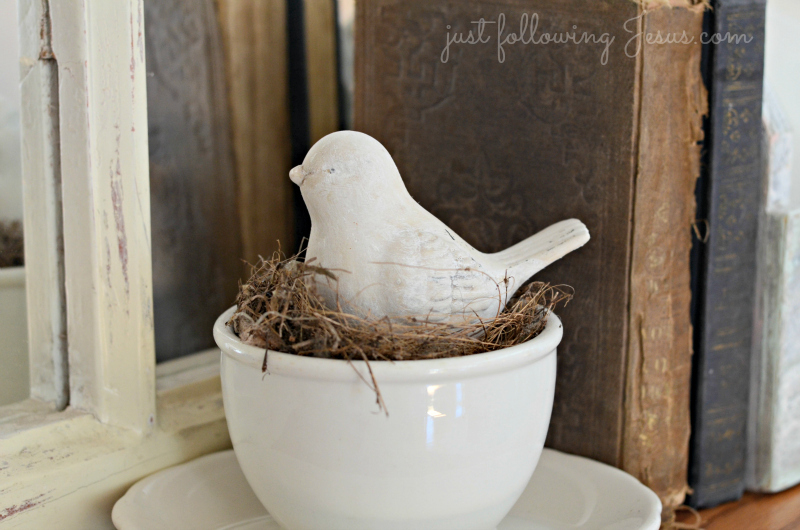 Some ironstone holds a ceramic bird sitting in a real bird's nest, found for me by my grandson. 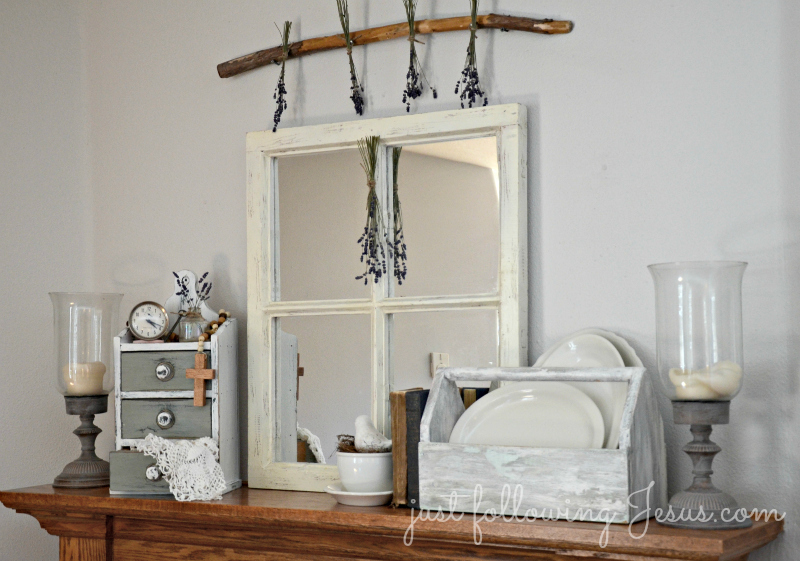 Dried lavender from last summer hangs above the mantel and an old ink bottle, on top the little set of drawers, also holds a few springs. We've had a mild winter, with many lovely sunny days. The crocuses are already blooming and the daffodils and tulips are shooting up through the ground. but that just makes the sunny days even sweeter. Elizabeth, Your mantel looks so fresh and springy! Love all the materials and textures you used. 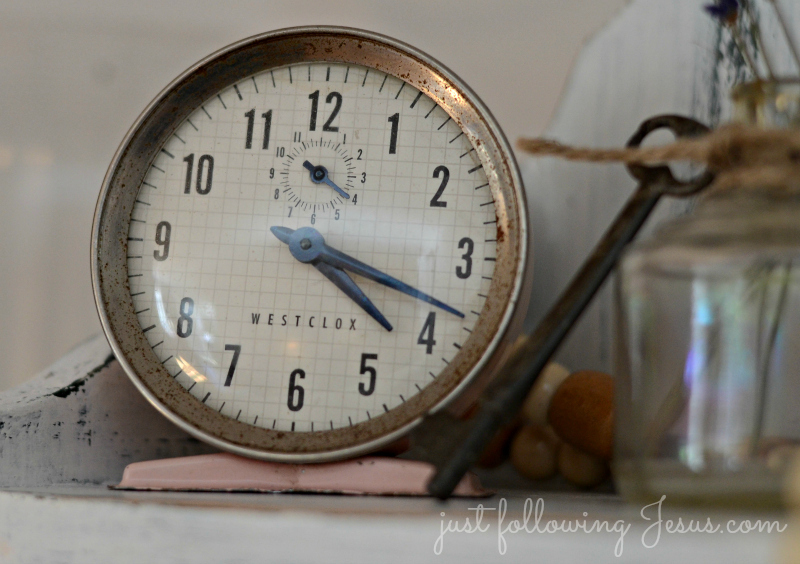 Your vintage pink clock is a sweetie! Yesterday I was working to lighten things up a bit too around my home. That hope of spring coming soon is a good feeling. I shall not covet your weather. Usually, we have a similar winter here, but this year we have had rain and cold and cold and rain. On the plus side, our rivers are finally filling back up after years and years of drought. So... it's all good. Not for ME personally, but still all good. As to your mantel, I love it. 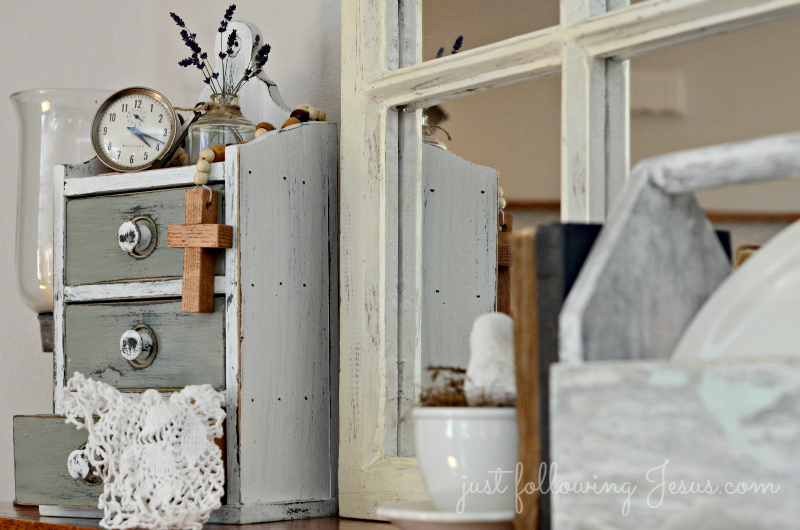 If I get a pair of minutes, I need to start thinking about a spring mantel. Right now, all I can see is tile and grout and grout and tile. Spring!?! Your spring touches are lovely. I yearn for spring. It's going to be a gloomy, cold, drizzly weekend on this coast. Brrr. It is so wonderful seeing the flowers start to sprout outside, isn't it?! You have an eye for the simple yet elegant! Please come and do my mantel...I'm so not good at decorating there even with help from Pinterest ideas. Loving your spring mantle. 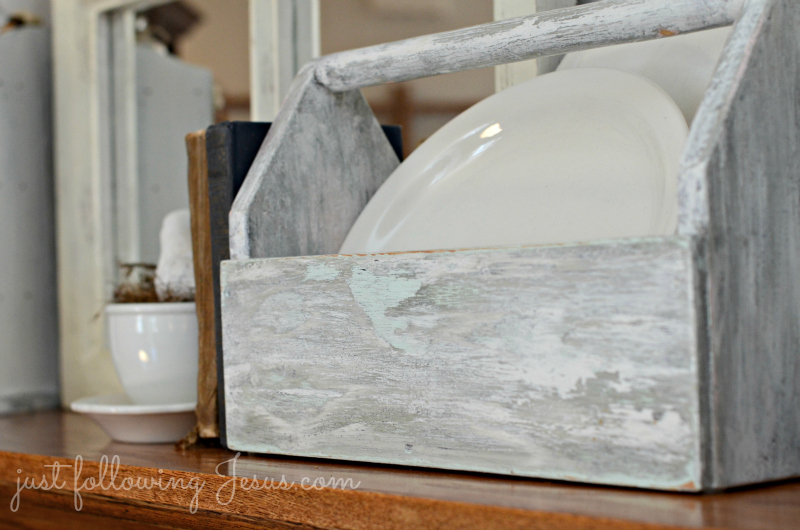 The old tool box is so cute and I love all of the touches of shabby white you added. Wonderful! Awesome pictures! Thanks a lot! Amazing pictures! It's very inspiring. What a lovely design! It is very beautiful. Awesome!!! Old-fashioned design is my weakness! I think, this content is really valuable. Nice post. I liked your photo and your creative idea. I can also advice you express-essays.com to get more interesting information for you. I am hoping the same best work from you in the future as well. I wanted to thank you for this websites! Thanks for sharing. Great websites! Higher education seems to be very important for university students. However, some guys do not have perfect writing techniques. It cannot be an issue to worry about. It can be possible with write my paper . Recently, I found a perfect essay writer at the best essay writing service, who helped completing my college assignment easily. This design is rea lly great :) If you need professional writing assistance, go to Custom-Essays-Online.com. Oh such a lovely design!What kind of things inspired you?Several years ago I wrote essay "Things around you" and this website http://advanced-writer.com really helps me! wow! very nice! You are extremely skilled and creative personality! www.essay-mania.com - will provide an opportunity to axpand its borders and get assistance in writing quality essays! Never Allow Worship to Become a Lost Jewel in the reflective essay Church of Jesus Christ or Even in Your Own Life! Thank you very much for this article ,well written and I learned a lot.